"Jenny Macklin, the federal minister responsible for implementing the pokies deal with Andrew Wilkie, is complaining that the industry is refusing to offer up any venues that will trial a mandatory pre-commitment system with $1 maximum bets. Jenny, ask your own party in Canberra. The Canberra Labor Club operates about 500 machines in the ACT and it represents the single largest investment asset owned directly by an ALP branch. Labor’s role as the only major political party in the world that fundraises through operating gambling venues is just one of many conflicts of interest which dominate the pokies reform debate."
. Labor - whose party is it?
. Ban large political donations. Starting here, starting now.
. The city the poker machines ate. Australia’s Wine Equalisation Tax is doomed. Both Treasury Wine Estates (owners of Penfolds and Wolf Blass), and Pernod Ricard (owners of Jacob’s Creek), have called for an overhaul in the way in which Australian wine is taxed. In very similar statements, these huge wineries have called for the current system to be replaced by an excise, as is currently imposed on other alcohol. This involves the drinker paying tax on the amount of pure ethanol in his/her drink, instead of paying tax on the retail value of the item. 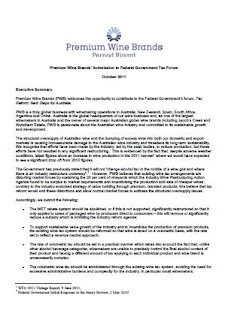 This must come as a huge embarrassment to the Winemakers Federation of Australia (WFA), as it indicates that some of the biggest wine companies in Australia have lost patience with the botch such industry councils have made in their attempts to “rationalize” the punch drunk wine business. To add the most severe insult, in their impatience with the WFA's hopeless efforts to correct the mess the business is in, they appear to have joined the wowser lobby's crusade to remove the WET. Either that, or they've been reading DRINKSTER. Between them, Treasury and Pernod Ricard annually vinify around 350,000 tonnes of grapes. 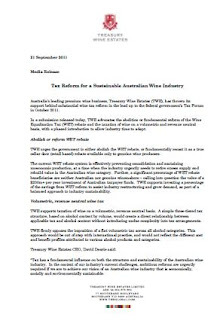 “Tax has a fundamental influence on both the structure and sustainability of the Australian wine industry. In the context of our industry’s current challenges, ambitious reforms are urgently required if we are to achieve our vision of an Australian wine industry that is economically, socially and environmentally sustainable. ...It was sold as a triumph for the little guys, the big nasty government assisting small producers by offering a rebate on tax paid when their income was low. Sceptics like this writer called it, from the start, an unfair system which saw makers of bladder pack plonk pay much less tax per litre than makers of premium bottled wine, and that this tax system had a whole lot to do with keeping bladder pack prices low to alleviate the forthcoming surplus. Put simply, the WET encouraged the enormously wasteful irrigated plonk business of the Murray Darling by keeping bladder prices down. This wreaks social, economic and environmental havoc. Echoing a call I made here a fortnight ago “Wet, Dry, Whatever – Oz Wine Hits Wall” the Treasury statement wisely “supports investing a percentage of the savings from WET reform to assist industry restructuring”. All this has happened since the September 6th launch, in Parliament House, Canberra, of the report, Alcohol Taxation Reform – Starting With The Wine Equalisation Tax . This was compiled by The Allen Consulting Group for The Alcohol Education & Rehabilitation Foundation (EARF), an alliance of health bodies established as “an independent, charitable organisation working to prevent the harmful use of alcohol in Australia”. At that forum, I said “many communities in the irrigated inland will need counselling, rebuilding, cash and perhaps even relocating” when this totally unequal tax system is replaced by a fair and logical volumetric excise, where tax is paid on the amount of alcohol in your drink, and not on its retail value. The excise recommended by former Australian Treasury boss Ken Henry – not to be confused with Treasury Wine Estates – would see wine of bladder pack quality increase to the equivalent of about $6 a bottle. There’d be little change to the price of a $20 bottle; expensive wine would fall in price. This report was ridiculed by industry councils like the WFA, but it seems to have rung out some raw truth in the ears of these very significant wine companies. The rorting of the WET has reached a perverse pitch. Pernod Ricard believes $30 million of WET rebate goes straight to New Zealand; the WFA itself told AERF they believed another $50 million is being rorted by retailers, who are taking money which was supposed to go to the same winemakers they discount to doom. Speculators have been buying fruit from growers who couldn’t afford to pick their crops, getting somebody to make wine from it, pocketing the WET rebate, giving the grower a pittance, and adding to the swilling wine lake which has not diminished in size, in spite of 2011 being the worst vintage in most people’s memory. It was in fact the second-wettest vintage in the history of Australian wine, and enormous amounts of mouldy and rotten fruit has been vinified, both by shady opportunists and panicking, desperate wineries. While refusing to accept that an enormous amount of the current wine lake is of dreadful quality, WFA CEO Stephen Strachan (left) admitted to the ABC that “the reality is that the WET rebate is contributing to some of the problems in the marketplace. “It comes down to the tax office looking at the intent of the law and applying it,” he said, “and there are a whole range of audits that are being undertaken at the moment, and those audits potentially will find that there are some who are abusing loopholes ... it probably requires a rewrite of the legislation so that the original intent of the WET rebate is delivered, not the outcome that we’re seeing now. Yes, Mr Strachan, indeed. “That happened.” Gee whizz. An oversupply that your organization should accept credit for. I'll tell you how that happened. It was the WFA’s 30-year-plan, instituted in 1995 to manage the growth of the Australian business until 2025 that encouraged such ridiculous levels of plantings that the whole thirty years’ worth went in before 2000. Croser and Sutton knew full well those plantings were in before they went off to Canberra to contrive the WET. They anticipated the fruits of their labour even before they'd produced a berry. So, as two of the biggest wineries seem to understand, the oversupply and the WET have been very firmly entwined ever since. How to get a pulse on the economy. NY Fed to monitor Twitter. Tip for @RBAInfo: Get with it. You are following zero of us. Start. Might there be a way out of the deadlock over policy costings? The Greens have offered to break a deadlock over policy costings that has had the opposition declaring it will use private sector accountants rather than official processes at the next election. The Coalition’s decision to abandon the Treasury in favour of two Perth accountants at the last election led to Treasury finding errors which it said amounted to almost $11 billion when did get to look at the policies after the campaign was over. The accountants remain under investigation by the Institute of Chartered Accountants more than a year after Sydney University professor Bob Walker complained they had breached professional and ethical standards by allowing Mr Hockey to portray their work as an audit when it was not. Institute chief executive Graham Meyer told the Herald he was following an orderly process of investigation, attempting to apply the rules of natural justice. Mr Hockey said he would shun the new $25 million Parliamentary Budget Office Tuesday after the independents, Greens and government combined to reject an amendment that would have ensured discussions with the Office remained confidential. Greens leader Bob Brown said he was now prepared to negotiate on confidentiality, so long as all parties were required to release any costings worth more than $100 million. A spokesman for Mr Hockey welcomed Senator Brown’s offer and said the Coalition would discuss it further. "It was just sheer and unadulterated panic overnight. The fallout from the FOMC meeting continued and global markets were smashed. Barely a day or two into things and operation twist has already wreaked havoc on the globe (although stronger USD is good). The fear now, following the Fed’s increasingly desperate and useless actions - is that there is nothing left to stave off global recession. Now at the moment we are not seeing any evidence of global recession. Growth by and large remains healthy although clearly, with the Fed just doing what it does, European politicians dithering and the constant media bombardment about crises and problems, many of which don’t even exist- the risks have risen markedly. The ‘crisis’ – pick one - has developed its own momentum, it is becoming a self-fulfilling prophecy, which of course makes it much more difficult to deliver solutions. The impact of this has been most marked on the sentiment indicators so far, as we already know. So it is no surprise, with everything going on, that the European PMIs weakened again in September according to data released overnight. This is turn just exacerbated existing fears about global growth and weighed on markets. The manufacturing PMI fell to 48.4 from 49 which is the weakest result since August 2009 (average 51.5), while the services PMI fell to 49.1, the lowest since July 2009 (average 52.9). It’s clear then that we’ve entered into what’s known circularity, a downward spiral of self fulfilling fear, feeding on fear. And it’s very difficult to see a catalyst for change. European equities were smashed as the Dax fell almost 5%, the FTSE was off 4.7% and the CaC was down 5.25%. In the US it wasn’t much better as the S&P500 fell 3.2%, the Dow fell 391pts (10733) and the Nasdaq fell 3.25% (2455) – SPI was down 1.9% (3890). The carnage was everywhere and every sector was hit, but basic materials (-6.2%), energy (-5.03%) and industrials were hardest hit. Commodities, were absolutely #%a& on. Gold lost $34 to sit at $1738, silver fell 11.6%, copper was down 7.3% and softs were off almost 4%. Crude too saw some big moves with WTI off 6.4% ($80.4) and Brent off 4.4% to $105.5. A strong USD, the only positive from operation twist, is a key driver here as we’ve seen the Dollar spike 2.1% so far (0.8% last night). AUD then lost another 250pips to sit at 0.9748 (lowest since March 2011), euro was down 93pips to 1.3462, Sterling lost 114pips to sit at 1.5349, while JPY was down to 76.22 from 76.51. The main implication of the weaker AUD is that it should gag those harping on about rate cuts here. These people had been arguing that the high AUD was hampering growth, restraining it and contributing to tighter financial conditions. For consistency then, the weaker dollar must, on their own arguments, reduce the need for the RBA to cut. Will be interesting to see what happens on that front. As I noted yesterday this at the least should be a period when our exporters are hedging aggressively. If the AUD goes lower still, then happy days, but if it goes higher, there is no excuse for whinging. In a general sense where we go from here depends largely on the Europeans now. They could end this at any time if they choose and there is a lot of pressure for them to do so soon – leaders from 7 nations including Australia writing to the G20 asking for action. I’d note though (as I did last year) that for all the vacuous discussion about Greece defaulting - orderly or not - it is actually the most costly option, it is the worst option. Europe has already lost about €200bn in economic activity thanks to the ‘crisis’ (which compares to Greek debt of about €350bn) and it is obvious that the subsequent loss of economic activity (should Greece default), contagion, recapitalisations and costs of building a ‘firewall’ more generally (under the orderly default option), far outweigh any bailout. It’s basic math. Yet supposedly intelligent people harp on about it as if it were the best or only option. The slogan is – ‘It’s inevitable’. Unbelievably, those who spruik this slogan refer to the Argentinean experience as a major default success story. Yet Argentina’s default didn’t change the need for austerity, it didn’t prevent the pain and in fact made it worse. Years after Argentina defaulted, the unemployment rate was still at 20%, youth unemployment much higher, and, a decade later, they have not been able to tap international debt markets. The scars run deep and for Greece it would be much worse. It is delusional to think of an ‘orderly default’ as a good option for Greece or Europe. On any, even rudimentary cost-benefit analysis, it doesn’t stack up." Actually, there's something about the uncaptioned photos in the brochure. Something to do with gender. Anyway, it's on now, it looks good, and it's on twitter at @AEF2011. Treasurer Wayne Swan will put up for discussion at the tax summit a radical idea that would allow companies to deduct losses from previous taxes paid, giving them a refund of tax already banked. Ahead of leaving for the United States to accept his award as finance minister of the year Mr Swan told parliament he was taking very seriously concerns raised ahead of the summit about the tax treatment of losses. In the budget Mr Swan allowed “infrastructure projects of national significance” to hang on to losses. The Treasurer said there was a case for going further and for “allowing businesses to deduct losses from previous taxes paid, obtaining a cash refund like some other OECD countries do”. He also wanted the summit to examine the idea of a deduction for equity finance, similar to the interest deduction that already exists for debt finance. “We will not jeopardise our strict fiscal strategy,” Mr Swan told parliament. Australia’s states should expect no extra help. Although their taxes were among Australia’s most inefficient, they shouldn’t wait for Canberra “to stump up the cash” to replace them. Grattan Institute economist Saul Eslake told a parliament house seminar he would go to the summit arguing our system was “a long way from ideal”. The goods and services tax was far too low. “The Labor party’s fraternal colleagues in Europe, where the tax was designed by social democratic parties specifically to pay for the welfare state, seem perfectly happy to preside over GSTs of no less than 15 per cent, in most cases 20 per cent, and in three cases as high as 25 per cent,” he said. Australia's tax reward for negative gearing was so unusual and so generous “one usually needs to explain to foreigners what the term negative gearing means”. Countries that didn’t allow negative gearing usually had healthier rental markets than ours. Trusts should be taxed as companies and superannuation payouts should be taxed as income. Treasurer Peter Costello’s 2006 decision to exempt entirely from tax super payments to people aged over 60 was “one of the worst tax decisions made in the past 60 years”. Although poorly conceived and poorly sold, the mining super profits tax was right in principle and should not have been replaced with a neutered tax that raise half as much. Gold will be excluded from the new tax at a time of record gold prices. One idea was to boost the company tax on miners from 30 to 33 per cent for as long as the boom lasts. Other businesses would have their tax cut to 27 per cent. The two-day summit begins on October 4. Reserve Bank deputy governor Ric Battellino has an answer to those who say they are concerned by rising unemployment: He doesn’t believe it. Australia’s unemployment rate has climbed from 5 to 5.3 per cent since the start of the year. The Bureau of Statistics says the number of unemployed has climbed 31,000. But the deputy governor says “other aspects of labour market numbers that have a stronger feel”. Addressing a Euromoney magazine conference in New York (the same magazine that made Wayne Swan Finance Minister of the year) Mr Battellino said the employment survey also showed solid growth in the total numbers of hours worked. Suspiciously the recent rise in unemployment had been “most pronounced in the resource-rich states”, suggesting growing unemployment was not widespread and is not the result of a two-speed economy. point to any rise in unemployment”. Neither measure is necessarily more accurate. NewStart doesn’t extend to everyone who is unemployed. The Bureau surveys only 29,000 of the nation’s 8.6 million households. The reticence is important. Along with inflation, employment is the key indicator targeted by the Bank. The “maintenance of full employment” is one of the goals etched into metal on the mural that greets Reserve Bank staff as they walk through the foyer into their offices each morning. Until the Bank can be certain employment is about to fall there’s not much chance of it cutting rates. The market thinks it will. Last night it was pricing in two interest rate cuts by the end of the year. But Battellino told the conference there were “technical reasons why current market pricing may not be giving an accurate picture of interest rate expectations”. The market had been wrong before. Between late 2002 and late 2003 it priced in cuts that never took place. Until a clearer picture emerged, the Bank would keep an “open mind”.
. Jobs growth. The damage. "Foreign observers must feel - watching Australia's existential struggles with our dribbles of illegal immigrants, and our fretting about how the mining boom is ruining us with its intemperate billions - like the poor neighbours of a lottery winner overhearing a steady stream of complaints about how the $100 notes keep clogging up the washing machine. The federal stimulus program, for which Swan has principally earned his Euromoney gong, is a good example of the broader phenomenon. To Euromoney, the stimulus program looks like a triumph because Euromoney is evaluating it purely as an exercise in economic management. As a giant funnel through which to pour revitalising funds into the Australian economy, the stimulus most certainly worked. But the Euromoney award, and the satisfaction of a non-dead economy, is about all the reward Mr Swan will get, because on the ground in Australia, the stimulus program is not just assessed as an economic tool. It's assessed on the value of all its constituent elements, all of which are immediate and apparent and photographable and much more easily explained than the spectral and – in the end – happily non-eventuating threat of economic meltdown."
. This Swan fellow... what's he really like? What'll it be at the tax summit... big issues, or housekeeping? What if instead of considering the big problems about to smack us in the face, the tax summit instead concerned itself with embroidery? It’s a serious risk. The summit will start in less than a fortnight. The published submissions are not encouraging. The person to watch at the summit - the one who along with former Treasury head Ken Henry knows more about the system than anyone else - is Greg Smith, the architect of dividend imputation, which he designed for Paul Keating in the mid-1980s; also a designer our fringe benefits and capital gains taxes; later the man who gave birth to the goods and services tax for John Howard as head of the Treasury’s revenue group, and along the way head of the secretariat that ran the Wallis financial system inquiry. Most recently he has studied every aspect of the tax system all over again as part of the Henry tax review. His big concern - as far as I can see unmentioned in the 60 or so submissions on the tax summit website - is that our income tax take is set to accelerate, slamming consumption, kneecapping the GST as a source of income for states and depressing the entire economy. Smith can read budgets. The latest has personal income tax collections soaring, climbing from $140 billion to $199 billion over four years. Much of it is due to bracket creep - what you expect if you don’t hand back the inevitable move into higher tax brackets year after year. What’s unusual is that for next four years none of it will be handed back; quite a change after eight successive budgets that handed back some or all of it. “The thing that amazes me,” Smith told a recent seminar “is that it dwarfs everything else we are debating”. Employers will have to start handing over an extra 0.25 per cent of their wage bill in 2013, climbing to an extra 2 per cent taking the super guarantee to 12 per cent by 2019. Will it depress the economy? No doubt. Will it hit already ailing goods and services tax collections? Smith says while income tax collections will grow $55 billion the GST will grow just $12 billion. Will it kill the ability to sell tax changes? Absolutely. There has never been a significant tax change that hasn’t been sold to the public by overgenerous personal tax cuts. With government finances in no shape to cut income tax, there will be no serious tax reform for most of the decade. Which doesn’t mean the forum shouldn’t prepare the way for when the time is right. The only problem is the government has made things harder. The increase in compulsory super - against the advice of Henry and his committee - makes it harder to fund the really big needs that will demand attention. The other big change Australia will have to confront is the need for a lower company tax rate. Smith is certain. The arguments in favour of it are overwhelming and the academic support fairly new. Smith dismisses many of the worthy concerns mentioned in submissions ahead of the tax forum, even those he agrees with. Yes, stamp duties could be replaced with land tax, road use could be taxed, special insurance taxes could be axed and alcohol could be taxed more evenly. But they’re not going to happen quickly and they’re not the main game. The goods and services tax will have to increase and we will have to prepare ourselves for it. But the big problems - the squeeze on consumption, looming aged care costs and the need for much lower company tax rates, they’re staring us in the face. Australia has struck it rich, and lucky, as it has used its natural resources to benefit from the China spending boom. But the careful stewardship of its treasurer, Wayne Swan, has played a key role in making it the best-performing economy among the world’s richer, developed nations. Not that he is likely to get much credit at home, as Eric Ellis reports. BLESSED WITH, AND industriously exploiting, a natural resources bounty pointed at China that would embarrass Croesus, some Australians will find it strange that Euromoney has chosen their treasurer, Wayne Swan, as finance minister of the year. The less charitable might even recall the words of Donald Horne, in his 1964 book The Lucky Country, which read: "Australia is a lucky country, run by second-rate people w ho share its luck." Swan would probably be among the first to admit that he has indeed had some luck. But his work as treasurer is acknow ledged by Euromoney as much for what didn’t happen to Australia on his careful four-year watch – economic Armageddon in the trail of the 2007-08 subprime meltdown, which he confronted in his first year in office – as for what he positively did, positioning Australia to pow er through the new crisis looming from abroad. "The fiscal rules that w e put in place to deal with the global recession when w e moved to stimulate the economy w ere ahead of the rest of the world," says Swan, in an interview from the kookaburra-chorused back verandah at his home in Brisbane. "These were the sorts of rules that w ere ultimately adopted by the G20 in its summits through 2009, this whole notion that you needed an exit strategy. At the time we moved to stimulate, we put one in place and we’ve been applying it vigorously. It’s not happening anywhere else in the world." As a result, Australia is one of only three OECD economies not to fall into recession since 2008, alongside Poland and South Korea. And it seems well placed to repeat the feat as the worsening euro crisis and US funk spread their infection. After two decades of grow th, Australia’s sustained expansion has been the most impressive performance of any member of the developed rich countries club. That’s all very well, but is Swan a worthy recipient of the aw ard, in this era of booming Brics and roaring Tigers emerging to trump the sputtering west? Former ANZ chief economist Saul Eslake of the University of Melbourne think-tank The Grattan Institute knows the 57-year-old Sw an well, and offers a qualified yes. "Sw an is certainly after glory," says Eslake, "but for his party, not for himself. He’ll be thinking how this gong w ill improve Labor’s chances of winning the next election, seeing it in intensely political terms as will, of course, his political opponents." The International Monetary Fund has slashed its economic forecasts for Australia, warning of a new global recession that would hit commodity prices and drive millions into unemployment worldwide. Hours before the Fund published its unexpectedly gloomy update in Washington, Australia’s Reserve Bank released its own statement expressing concern about the global outlook and opening the way for interest rate cuts should things deteriorate. 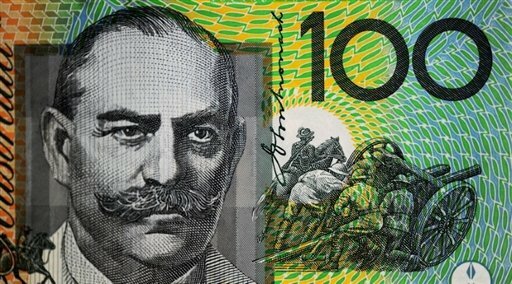 The Australian dollar slid to a five-week low of 102 US cents on renewed concerns about Europe after Italy lost its A+ credit rating. Australian shares lost one per cent. The IMF says Australia will grow at just 1.8 per cent this year, down from its previously forecast 3 per cent. The forecast is way below the May budget forecast and only half the most recent Reserve Bank forecast, suggesting it’ll harder than expected to reach the promised 2012-13 budget surplus. For 2012 the Fund forecasts a better 3.3 per cent, down from 3.5 per cent. But it takes trouble to point out these are best-case forecasts, made on the assumption almost everything goes right. It’s best case is for “anemic” growth in the advanced economies of 1.6 per cent and for global growth of 4 per cent. “However, this assumes European policymakers contain the crisis in the euro area periphery, that US policymakers strike a judicious balance between support for the economy and medium-term fiscal consolidation, and that volatility in global financial markets does not escalate,” the Fund says. If one or more of its best-case scenarios don’t eventuate the United States and much of Europe could slide back into recession... commodity prices could slide “abrupty,” and much of the rest of the world would be face a repeat of the 2009 global financial crisis. The update is prefaced by an unusual apology. Chief economist Olivier Blanchard says he “largely failed to perceive” the slowdown as it was happening earlier in the year, wrongly blaming it at first on one-off events such as the Japan’s earthquake and tsunami. So uncertain is the Fund of the best way forward it stops short of offering advice, saying merely the right approach depends on “individual country circumstances”. The usual advice of tighter budgets could “lead to even lower growth”. The Fund says Australia is in about the best fiscal position of any developed country, having the second-lowest government debt of 29 advanced economies, being beaten only by Estonia. Treasurer Wayne Swan who is about to travel to Washington for the weekend IMF and World Bank annual meetings said the update was a “stark warning,” indicating the global economy had entered “a dangerous new phase”. The Reserve Bank expressed concern about “extreme volatility in financial markets” reflecting fears about a global slowdown and an escalation of debt troubles in the United States and Europe. It would pay attention to these developments in deciding how to move rates.
. Now its a global trade war. Soon. Modelling. Plain packs. Could our government stuff up them too? Its track record suggests so. Crispin Hull knows a thing or two about the High Court. He has literally written the book on it. Here's an extract from his column in Saturday's Canberra Times. IT LOOKS as if the Government is about to give the tobacco companies a leg to stand on in their objections to plain packaging. Its legislation gives the Minister huge power to make regulations to fix up any unintended consequences of the plain-packaging legislation as they affect the operation of the Trademark legislation. It is like a catch-all repair mechanism for minority government fearful that it would not get parliamentary approval to legislate to fix any unintended consequences – particularly an unintended consequence of leaving the Government exposed to a successful compensation claim. But changes it proposes to the regulation-making power in the Trademarks Act looks to me to self-evidently unconstitutional. Now here comes the technical bit, but bear with me. The new legislation provides the Minister with a sweeping regulation-making power. It says, “Regulations made for the purposes of [giving effect to the plain-packaging legislation]: (a) may be INCONSISTENT with this Act; and (b) prevail over this Act . . . to the extent of any inconsistency. But basic constitutional law tells you that a Minister cannot make regulations inconsistent with an Act of Parliament. The Minister, like everyone else, must obey the law. Further, it is beyond the legislative power of the Commonwealth to delegate its power to the Executive so that the Minister in effect is legislating. On first reading, I thought it was a misprint. Usually, the regulation-making power is described as to be NOT INCONSISTENT with the Act. It will not take the High Court long to knock this one on the head and declare the legislation invalid or at the very least declare invalid any regulation the Minister purports to make that is inconsistent with any law of the Commonwealth Parliament. Treasury boss Martin Parkinson has backed a move to wind back or abolish real estate stamp duties saying they make it hard for workers to move west and north to take advantage of the mining boom. 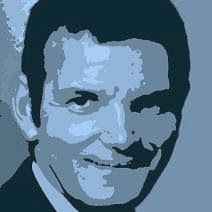 Asked at an Australian Industry Group forum which taxes were the biggest drag on productivity, he nominated state taxes on housing which he said inhibit economic adjustments, “whether they be individual workers moving from the Illawarra to Queensland or Western Australia to work in the mining sector, or whether a firm is trying to restructure its business”. “We need to encourage change, not to stand it in its way. That’s why I make specific reference to state governments,” he told the conference. NSW made $3.9 billion from real estate stamp duties in the year to June, around one third of the national total. Abolishing the could be paid for by increasing the goods and services tax by a quarter, from its current rate of 10 per cent to 12.5 per cent. “The only positive feature of stamp duty - its relative simplicity - has long since ceased to justify its continued use in the face of the costs it imposes on Australian society,” the review said, recommending they be replaced by a broad land tax. Professor Neil Warren who reviewed state taxes for the Independent Pricing and Regulatory Tribunal in 2008 told the Herald it was universally acknowledged among the states that stamp duties should go, but said the transition was difficult. Doctor Parkinson had little sympathy for business figures who said the industrial relations system was holding back the economy, telling the forum productivity had been slipping for ten years, regardless of the industrial relations system. There was “no magic pudding” that could help manufacturing businesses through difficult times. There could not be a return to protection and there could not be intervention to “adjust” the exchange rate. Manufacturers had to adjust to the higher dollar and reinvent themselves had they had throughout history. The rise of China presented opportunities as well as threats for Australian businesses. Australia's 3.4 million pensioners can loosen their belts from tomorrow. They’ll get a pay rise of $19.50 per fortnight. Their fellow Australians on NewStart unemployment benefits and student allowances won’t be so lucky - they’ll get an extra $11.73 per fortnight. The disparity means that NewStart - at present worth just two thirds of the pension - is set to fall to less than half of the pension by 2040. Even worse, new rules governing eligibility for the disability support pension due to take effect in January will tip an increasing number of Australians off the disability pension onto NewStart, cutting their take-home pay $262 per fortnight. The OECD reported last year that NewStart had be come so low as to raise “concerns about its adequacy”. A Bureau of Statistics survey this month found that four in every five NewStart recipients reported significant financial stress, more than any group identified. The single NewStart rate is $34 per day, due to increase to $34.76 on Tuesday. By contrast after Tuesday the single pension will be $748.80 per fortnight - $53.50 per day. Pensioner couples will get a combined $1129 per fortnight. New rules introduced by the Rudd government increase pensions by the larger of three different indexes: the consumer price index, the pensioner living cost index, and male total average earnings. Two of the past four half-yearly increases have been driven by male earnings; the other two by the pensioner living cost index. None have been driven by the lesser consumer price index. NewStart and student allowances recipients get only CPI increases, which are typically the lower of the three measures. The Centrelink website wrongly says the CPI increases adjust payments “in line with increases to the cost of living”. The Bureau of Statistics website makes clear that the CPI is not a measure of the cost of living and has not been since changes were made to the index in 1997. A large one-off jump in the pension in 2009 means that in the past two years the buying power of the fortnightly Newstart allowance has slipped $22 while the buying power of the pension has climbed $175. ACOSS will ask at next month’s tax summit for an immediate increase in NewStart of $50 per week to take it to $586.60 per fortnight, somewhat closer to the $748.80 per fortnight single pension. The measure would cost around $1 billion. “It’s the sort of range the Henry Review was looking at. We support the idea of trying to get people on the disability support pension into work, but giving them a pay cut along the way makes it too hard,” Dr Goldie said. We are becoming a nation of service providers. Manufacturing, until ten years ago Australia’s biggest employer, is a shadow of its former self. In the year to August it has shed 53,800 workers, 30,000 in the past three months. New detailed labour force figures show “health care and social assistance” is both Australia’s biggest employer and second fastest-growing employer, taking on 44,500 extra workers in the past year, eclipsed only by “accommodation and catering” which took on 44,600. What the new growth industries have in common is that they don’t “make things,” to use the language beloved of politicians. They are also predominantly female. In the past year 101,500 extra jobs have been found for women, only 38,900 for men. The biggest loser - “agriculture, forestry and fishing” which shed 63,000 jobs in the year to August - is predominantly male. The only clear exception to the trend is mining, a male-dominated industry whose labour force has surged 14 per cent in the past year - more than other sector... But in absolute numbers it is still not able to offer that many jobs. It put on an extra 27,800 workers in the year to August, well down on the number put on in public administration and safety and finance and insurance. Even after stellar growth, mining employs just 2 per cent of Australia’s workers. Health care and social assistance employs 12 per cent, retail sales 11 per cent, education and training 7 per cent, and the finance industry 4 per cent. All of these big employers provide services. The exceptions are manufacturing - which employs 8 per cent of Australia’s workers, down from 9 per cent a year ago - and construction which employs 9 per cent and piled on an extra 31,700 in work associated with the mining boom. Both men and women who lose jobs are finding it harder to get new ones. The average time out of work for a man has climbed from 41 to 45 weeks in the past year. The average time out of work for a woman has climbed from 31 to 42 weeks. Long-term unemployment is climbing again. The number of people out of work for a year or more climbed 15 per cent to an 8 year high of 133,100. 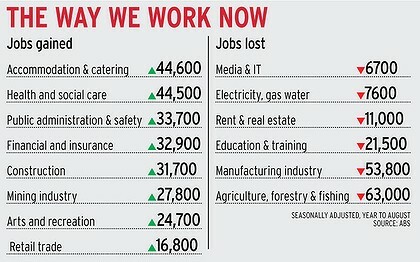 A Westpac survey released yesterday found households increasing concerned about jobs. The number of households worried about unemployment climbed 8.5 per cent in September after climbing 2 per cent in August. Concern about unemployment is up 44 per cent over the year. The government’s million dollar man, our highest paid public servant, will get to keep his pay for as long as he is in the job. But his successors won’t be so lucky. Treasurer Wayne Swan revealed yesterday he had stripped the Reserve Bank board of the power to set its governor’s pay, handing the authority instead to the remuneration tribunal. But a side letter to the board from special minister of state Gary Gray guarantees governor Glenn Stevens can keep his $1.05 million per annum package until his term expires in September 2013. The Reserve Bank board decided on a “sizable” $239,000 boost in governor Stevens’ pay as the financial crisis unfolded in late 2008 but didn’t tell the Treasurer until nearly a year later. A furious Mr Swan wrote back that in future he expected the bank to “discharge its powers with an emphasis on ensuring salaries are adjusted to be in line with community expectations”. The quarter million dollar boost amounts to most of Treasurer Swan’s entire $288,865 salary... Mr Stevens takes home five times as much as the head of US federal reserve and twice as much as the heads of the Treasury and prime minister’s department. Prime Minister Julia Gillard earns $366,366 - around one third the governor’s package. Mr Swan believes the increase weakened the ability of the governor to speak out excessive pay rises and was out of step with government moves against high executive salaries. In an interview with Bloomberg News published yesterday he said he had “put in place a set of arrangements that mean future decisions taken about those salaries will be in the context of other salaries paid to comparable people in the public sector”. "I have taken that action so that when the board takes its decision, it takes its decision within a framework set by government." Prime Minister Gillard endorsed the Treasurer’s action saying she would “absolutely agree with the words of the deputy prime minister”. The change was gazetted a month ago. At the same time the special minister of state wrote to the Bank board saying Mr Stevens could keep his salary while he remained in the job. His successor’s salary will be in a band set by the tribunal. board have the power to determine the exact salary paid to the governor within that band. In July Mr Swan introduced a “two-strikes rule” that gives shareholders the right to vote on a motion to spill a company’s board if its remuneration report receives a no vote of 25 per cent or more at two consecutive annual meetings. Although large by the standards of his contemporaries overseas Mr Stevens salary package is approached by other heads of statutory authorities. The Future Fund annual report reveals its highest paid executive takes home between $925,000 and $939,999. The remuneration recently lifted the salary package of the head of the Australian Prudential Regulation Authority John Laker to $800,000 and those of the heads of the Securities and Investments Commission and the Competition and Consumer Commission to $700,000. The tribunal said one the factors it took into account was the need for comparability with the salary of governor Stevens.